How are returns (RMAs) handled? Returns are processed either from an existing order or created from the customer. 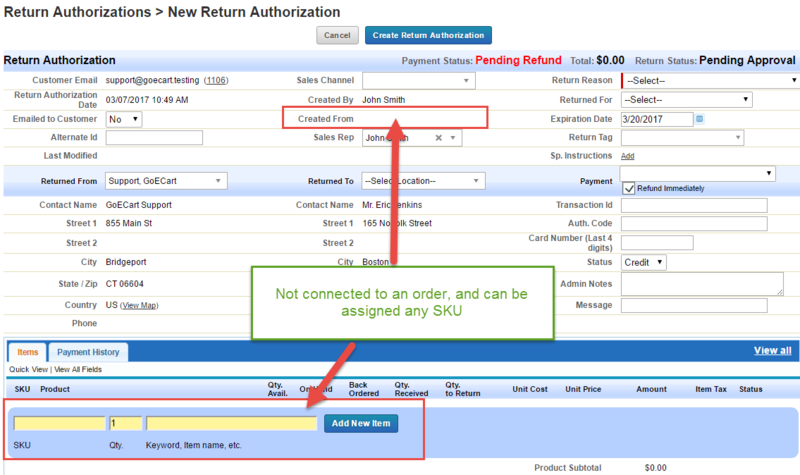 If a return is created from an existing order, then the return can only include items from the order, but the order will be linked to the return. If the return is created directly from the Order or Customer tabs, then it will not be connected to any specific order and can include any items. This is useful if there is a customer that routinely purchases items, and at the end of the month sends back one shipment for all unneeded/unused items, etc. Navigate to the desired order via the Orders or Customer tab. At the top and bottom of the Shipped order, there is an Authorize Return button. This return is connected to the existing order, and can only include items from the order. 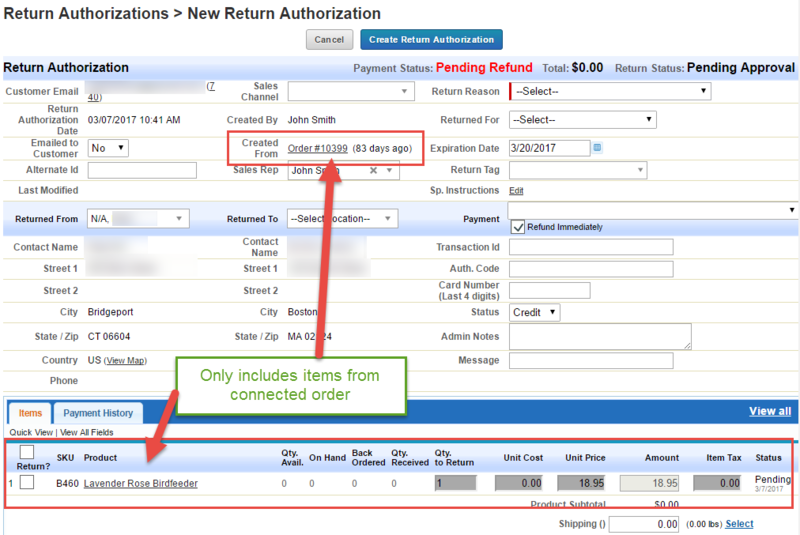 Return Authorizations > Create New Return Authorization > Select the customer record. Customers > Search Customers > Select the customer record > Return History > Create New Return. 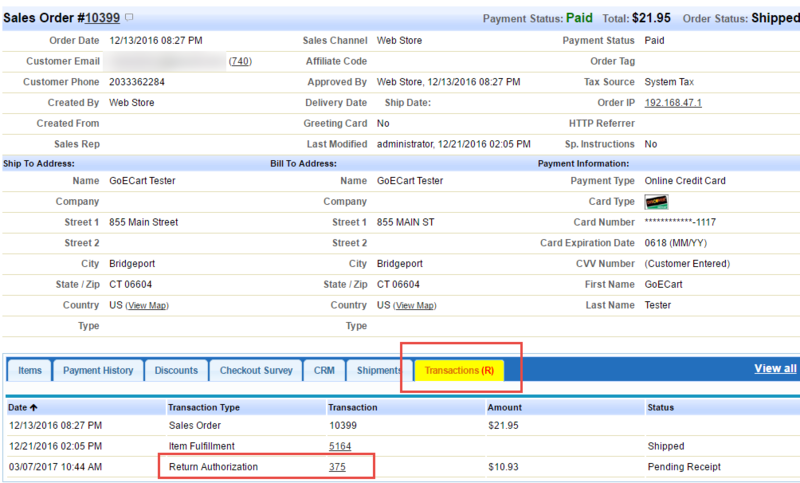 Both of these actions create a return for the selected customer, that can be assigned any SKUs. Shipping charges will reduce the refund amount (as you are paying them). If your return policy provides free return shipping, remove the shipping charge. Handling/Restocking Fees will also reduce the refund amount. Credits offset or increase the customer refund. It could be that your return policy does not provide free return shipping, but in certain specific instances you do; you can provide a credit for the cost of shipping, to credit back the customer the shipping surcharges. Tax increases the customer refund. Once a return is created, you may generate a shipping label and send it to the customer for them to print out and put on their return package. 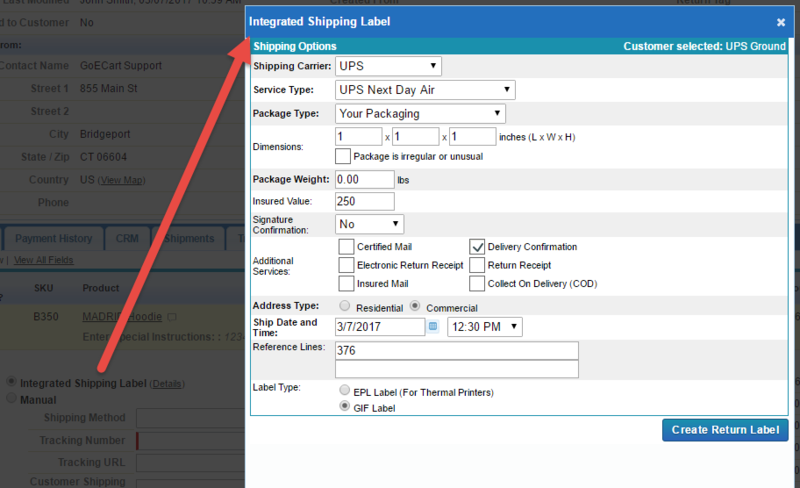 Like generating labels for orders, this action asks you to specify Manual or Integrated Shipping Label generation, then prompts you to specify the details of the label. Note: The address information for a return is FROM the customer address TO your specified warehouse location. In general, the best practice for return warehouse location is the virtual warehouse, Zip, City. Alternatively, you can specify a production warehouse, but note that as soon as you receive the return, the SKU's available quantity will increase, potentially allowing the product to be selected for a different sale before you have confirmed the SKU is in valid sale condition. Once the label has been created, you can send it to the customer via CRM > Email Customer. Once the customer has sent the products back to the warehouse click Receive Return at the top, or bottom, of the screen. Select the SKUs and Qty in the customer package, and Save Changes. This adds the specified quantity to the target warehouse. If all items from the return have been received, then the Return is fully received.